This is a back-port of the WonderSwan Color version of my homebrew Swan Driving so that is works on the original WonderSwan (Mono). It's largely the same, except it lacks the weather effects (rain). The brunt of changes were around converting all bitmaps to use four-colour palettes, and replacing palette-loading code to initialize the palettes explicitly in the code. 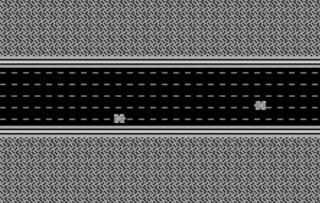 Swan Driving BW is a WonderSwan homebrew where you control a car, trying to avoid incoming traffic. Your car has a low and a high gear, for driving slowly and fast, respectively. Use UP/DOWN to move your car, and LEFT/RIGHT to select low or high gear. Swan Driving BW is meant more as a tech demo, to be useful for others trying to kick-start their WonderSwan development. It features a scrolling background layer and sprites for the cars. Fortunately for me, the WonderSwan CPU is x86-compatible, so writing the game in assembly language did not require a steep learning curve. Dev kit with ready-to-compile source code for Swan Driving BW - get this if you wish to compile the Swan Driving BW ROM yourself, or if you'd like to develop your own games using this as a starting point!